The costume designer, cinematographer and production designer give new dimension to the first lady. In talking about crafting one of the most exquisitely realized cinematic experiences of the year, Jean Rabasse, the production designer behind “Jackie,” stopped himself for a moment. “This is the history of making a film – afterwards, you can say this or you can say that, but the reality is slowly but surely you build the aesthetic of the film,” insists Rabasse, drawing an intriguing parallel to the film he was making. 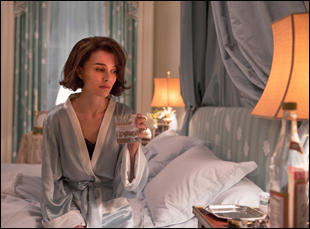 Propelled by a fearless turn from Natalie Portman its center, “Jackie” defies the standard biopic treatment of famous figures, with screenwriter Noah Oppenheim and director Pablo Larrain using the aftermath of the assassination of John F. Kennedy to reveal Jacqueline Kennedy’s true character and the steps she took to protect her husband’s legacy. 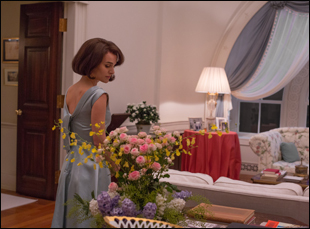 Yet in showing how Jackie would refuse to be defined by history, but rather how she would define it, a team of accomplished behind-the-scenes artists – including Rabasse, cinematographer Stephane Fontaine and costume designer Madeline Fontaine – are able to redefine what the standard of authenticity in such films, skillfully recreating the Camelot years in the White House, but even more impressively, using space, textures and color to allow audiences into the first lady’s fragile mental state in the days after one of the most devastating events in American history. 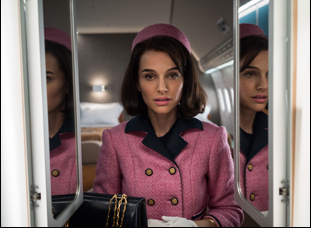 Whether it was recreating Jackie’s iconic pink suit right down to the exact buttons, chain and period label provided by Chanel or figuring out a lighting design that permitted Larrain and crew to roam freely to reflect Jackie’s search for herself amidst a place familiar to all Americans and yet in an instant, completely unrecognizable, the filmmakers shake the moment free of the history books and bring it enthrallingly into the present. While in Los Angeles recently, Rabasse and the (unrelated) Fontaines spoke about being freed by the film’s strict attention to detail, how their research led to reworking certain plot points and turning reality into something transcendent. Stephane Fontaine: It’s probably one of the projects that is really hard to turn down. You’ve got a pretty interesting director with quite a unique style. He has a voice definitely – all of the movies he’s shot before are quite different from one another, and all are really interesting. Madeline Fontaine: And very personal. Stephane Fontaine: This plus Natalie Portman in something that’s like the creation of a myth was quite exciting actually. Madeline Fontaine: We were not at the same place at the beginning, which was difficult. [Jean] was in the studio building and we were on a lot…but we were in contact. Madeline Fontaine: Not even in Paris! Jean Rabasse: And we knew we had to talk all together. If not, with only 10 weeks of prep, we could fail, so there was an urgency, but in a very positive way. We had to be very focused on doing the best quality as possible because we knew that Pablo was a very good director to recreate not a period film, but a reality of period, which is very different. We had the very clear point of view of Pablo Larrain about the fact everything in the story has to be from the point of view of Jackie Kennedy and not trying to create a beautiful period set in ’63, and I feel good that we are very realistic in terms of design, in terms of costume and the light and the architecture and the furniture, but we are not making a new “Mad Men.” We could’ve made some mistakes like doing too fancy props, but we had to be straight to the point. Madeline Fontaine: Not having the time, I think it [emphasized] creating the reality of a feeling, of an atmosphere, which was very important. We were working the same way [as the other departments although with] costumes, it was a bit different because we couldn’t avoid the image of this outfit she wears – everybody knows that, but out of that, [we focused on] a feeling of how she wears it, how the texture is done and the details that seem to be different – it’s handmade, it’s not perfect. It speaks of the period, from my point of view, and this creates this atmosphere [of being] very close to the feeling of this woman. I understand the color palette had to work in the color and black and white scenes, so you wouldn’t need to make adjustments. How did that dictate the overall look? Jean Rabasse: From the beginning, we knew Pablo works in such a way, mixing the existing footage to our film and that means very quickly we had to make a lot of tests for the camera…[for instance in] the East room – we had to be very accurate in what the [chemical] reaction of the color of the curtains will be [on film], so very quickly we had to discuss the palette all together and Stephane says that inside the White House has to be the nest of the family. It’s like a protected area, so the color has to be in a certain range of color with a certain contrast, and when you’re outside in the reality of the violence of that history, you go to the saturated color. The good thing is we talked a lot all together. We are not great artists in the office and saying it will be like that – that’s not true. It’s something you discover slowly. The first thing was to say, “Okay, we want to have the whole set altogether with the freedom [to have] 360° filming [where you’re] able to frame where you want all the time you want. It’s a decision of Pablo and Stephane to have the feeling that we are with Natalie, close to her. That meant we made a transparent ceiling to let the light come through. Some of these technical decisions like that made the aesthetic of the film. Stephane Fontaine: We shot very often in sequence. One of the key things was since we wanted to feel what would be in Jackie’s mind, which meant that a traditional way of shooting a shot in reverse would be counterproductive because actually being in someone’s mind is more like being in the constant flow of emotions. It really helped a lot to be able to walk with Natalie and be able to walk any place she wanted to go. [But to shoot 360°], the whole set had to be ready from day one because it meant that eventually Pablo would be able to build scenes and have Natalie walk in every room that were ready – and all of them were ready [on time]. Jean Rabasse: And it was important to give the sensation you can go everywhere you want – to the bedroom and then you have a corridor and you go directly to Jackie’s bedroom and then you go to the cabinet and you have the bathroom. It was important to leave the possibility [of that continual flow] to Pablo Larrain to have that shot and that you are inside the White House with her. It was the way to create that intimacy with Jackie. Stephane Fontaine: Thanks to Jean [we were able to] do extensive tests during pre-pro and it meant that at some point we were able to find the toolbox and all the tools that we wanted to use for the movie. [That included] finding the right colors and the right palette, but also the right lenses as well. [For the scene on Air Force One after Kennedy has been assassinated,] we thought that using wide lenses would help us to be extremely close to Natalie at the same time [we’d] have a sense of the surroundings [when usually] you’ve got an extremely abstract background. We used this abstraction on one occasion when we’re onboard Air Force One and Johnson takes the oath [of office] to show how disconnected she would be now from then on, from the world she used to know. And actually the one thing that struck me was that since we decided to shoot 360, it meant that no lighting equipment could be on the floor, so it also meant that when you walked onto the set, eerily, it was like a time travel because you’ve got all these people, especially Natalie, dressed in ‘60s outfits and it felt like an actual place where people would live, which was an odd thing to experience. When you’re adhering to such authenticity, is that something that’s a burden or does it open up new avenues creatively? Stephane Fontaine: That’s the best freedom ever. Once you’ve got a fairly strict frame, you’re absolutely free to move within that frame. Jean Rabasse: It’s like a classical musician – you’re not in a jazz band and you have to create every single moment of the music. You are an interpreter, so it means okay, this part is done, so the rest of the time of creation is pure creation. I remember the moment we decided to shoot inside the bathroom of Jackie. It’s almost exactly the reality of her bathroom – we recreated the same bathroom with the same mirror, [so it was like], okay, we have the bathroom. What can we do? Having those two mirrors, I quickly proposed to Stephane, do you think it’s interesting to be behind the mirror? The first time I showed the master plan [of the set] to Stephane [I asked,] where do we put the mirror because it’s surrounded by mirrors, so how do you shoot a place like that [without reflecting back on the crew]? Very quickly, the purpose of being outside the bathroom through the mirror was a good possibility not to see the camera and the crew and you have the feeling that you are very with her. You’re on the side of Natalie and that kind of idea doesn’t come if you create everything. It’s a possibility, but when you come from the reality, it gives you a lot of ideas and possibilities. Madeline Fontaine: You have to adapt to the situation. Jean Rabasse: Creatively, it’s very interesting because you have room to have new ideas that are not in the script, that’s not in the master plan of the real plan of the White House, so being very precise doesn’t mean you’re not creative. There actually is a great insight into the character made involving the White House carpeting, which I understand may not have happened if you hadn’t done the research into the White House interior design of that time. Jean Rabasse: The red one – [we did] a lot of documentation and we discovered that for Kennedy, the carpet was blue/grey with the design of the White House and the presidency office on it, so we thought we had to do that one, but what we learned is Jackie had a huge influence in the decoration and design of the White House. She decided to change the color of the carpet to red, but for many reasons, the only moment that it was possible to put that red carpet [in] was during the journey to Dallas, so when she came back from the assassination – and it’s what we see in the film – she discovered that red carpet, which is very strange because it’s very vibrant and very strong and it’s like a subliminal message for her. At the beginning of the script, it was not written like that, but it was something we discovered during the research for the set design. Is it true that, being in France, you were actually sourcing fabrics from the same places Jackie was? Madeline Fontaine: No, no, no. Jean had some fabrics, which were all really the ones she used for curtains and [other] things in the room. I found the [fashion] house which made the fabric of the pink suit [Jackie wore on the day of the assassination] – it still exists and they would’ve done it for us, but we had this question of chemical reaction to the choice of camera to have the right pink at the end, so we decided to choose a fabric, and to dye it in different shades of pink to have the one we wanted at the end, but we kept it inside the workshop. What has it been like to see this come together? Madeline Fontaine: As Jean said, when you work on something, you’re just focused on making it the best as possible and sometimes you surprise yourself – you surprise yourself with how you’ve been conscious of the whole thing without noticing it and it’s always good to see that it works at the end. Stephane Fontaine: Yeah, suddenly you start doing things that you didn’t know you were able to. Jean Rabasse: One thing that was very important with Jackie Kennedy was that she was one of the first to say to the American people, you have to be proud of the set design of the White House – it’s your culture, it belongs to you and you have to recognize that and protect it. So for us, it was important that the film was well-accepted and that in America, the audience [says] this is something that belongs to us and it’s an important part of our culture. When I see the reviews, it’s something that seems to work and it’s the best recompense we can have [since] this is like the message of Jackie. It’s not the only one, but it was an important one – be proud of your culture and be proud of the design of the White House and the legacy of JFK. 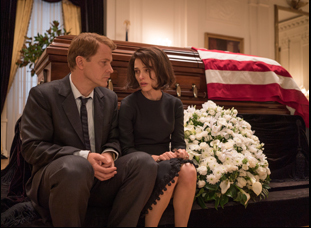 “Jackie” is now in theaters. Interview: Producer Iain Canning on Raising "Lion"